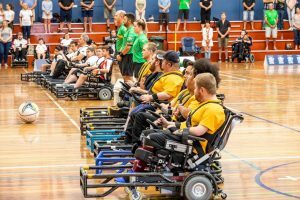 The Australian Government, through the Department of Social Services, supported the 2018 IDPwD* Australian Powerchair Football Association (APFA) National Championship. Powerchair football is an adapted version of soccer for people who use powerchairs in their everyday life. It’s all-inclusive, yet fiercely competitive, becoming the fastest-growing powerchair sport in the world. From 24-30 September 2018, the Queensland Powerchair Football Association (QPFA) hosted the 2018 IDPwD APFA National Championship in Brisbane. Holding the event outside Sydney for the first time introduced the sport to a new audience, with numerous people with disability approaching APFA and QPFA, wanting to take up the sport. The following seven teams participated in the Championship: NSW, Victoria, Western Australia, and two teams each from Queensland and New Zealand. Over 100 attendees including athletes, carers and officials, attended the event. The Queensland Cyclones defeated NSW 4-3 in the Grand Final, with Kiwi Red from New Zealand securing third place. The event was livestreamed for the first time, obtaining 5,000 views across the week, including American viewers, and over 40,000 impressions on Facebook for the week of nationals and the week following, with an average of 130 engaged users per day. Many of the athletes never thought they would be able to participate in team sport. This event has demonstrated to people that it is a very real opportunity, with a clear and meaningful pathway to international sport. Further, the event promoted inclusion and celebrated the achievements of people with disability. “I loved the inclusiveness of all there and the genuine love of the sport. I was also surprised by the skill level of the players” – spectator. “This is the best Nationals I have attended. It was well planned and catered to all needs. Well done” – athlete.